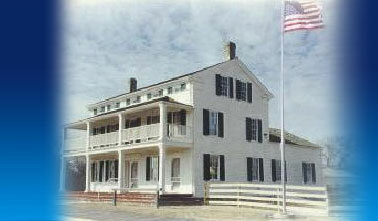 This stately Greek Revival Inn, once stood at the corner of Bluemound and Watertown Plank Roads. It was built in 1842 by Talbot Dousman, whose brother’s son Hercules, later built the Villa Louis in Prairie du Chien. In 1857, Daniel Brown purchased the property and ran it as a stagecoach inn to accommodate travelers using the plank road that ran from Milwaukee to Watertown, Wisconsin. 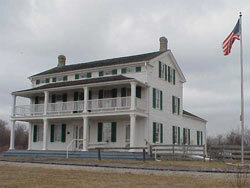 After 1875, railroads supplanted stagecoach travel and the inn became a farm owned by Frederick Zimdars. From 1887 to 1980, its owners were Charles Dunkel and his descendent, John Behling. John Behling donated the inn to the City of Brookfield who leased it to the Elmbrook Historical Society. In 1981, the inn was moved by the Elmbrook Historical Society to its current location at 1075 Pilgrim Parkway in Brookfield, Wisconsin. 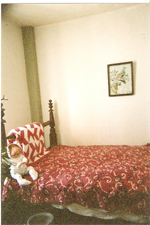 Since then, society volunteers have restored and furnished the Inn with beautiful authentic antiques to the period when it was a stagecoach inn. In addition, outbuildings have been added: The Donaldson Visitor’s Center/Gift Shop which was originally a 1852 log cabin, an Ice House, a Smoke House, a Wagon/Blacksmith Shop, and the Old Woodside School Bell Tower.